Getting kids to follow directions is TOUGH. You tell them to go upstairs to get dressed and they pull out their clothes, start playing and forget the getting dressed part. Mom asks them to put their homework into their backpack and put the backpack away and she finds the homework on the coffee table and the backpack on the steps. Following directions and childhood can be a real struggle! They get distracted, resist, or forget instructions and the tasks they were supposed to complete are half-way done. 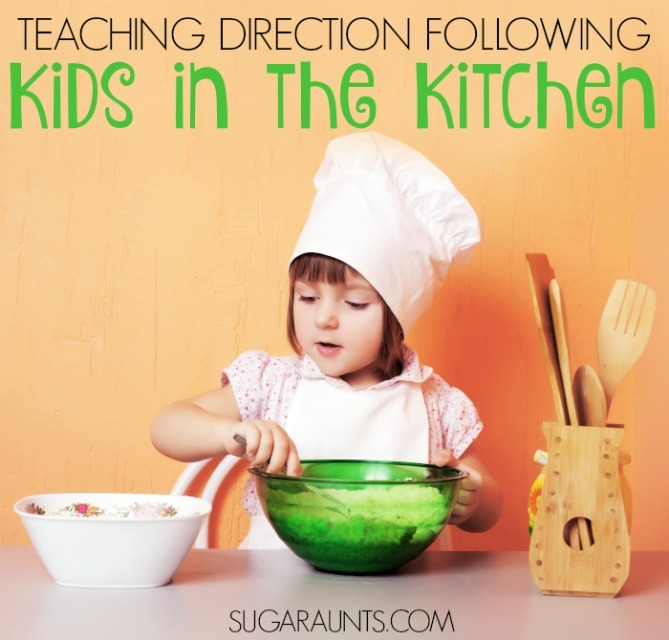 Today, I'm sharing ways to work on direction-following while cooking with your kids. Time, practice, modeling, structure, growth, and play can help with direction following. Today, I have tips, tools, and ideas to help cook with your child and work on direction following in the kitchen. If you have been following this blog for long, you know that I love to get my kiddos busy in the kitchen. They are my little helpers; my ingredient-grabbing, dish-washing, egg-cracking, apron-clad cuties. My favorite part of cooking alongside my kids, though? I love the one-on-one time (or usually, the group dynamic of more than one helpful child) while we cook a dish that we enjoy as a family. It's productive and real-world creativity and meaningful time spent together. Cooking with my kids provides time of memory building (and ALL four kids never forget to ask to lick the beaters when we bake...or that time the flour flew up out of the mixer and all over the fridge...). But, not only are we cooking up memories together, we're making fun dishes that my kids recall long after the dishes have been washed and the many (Oh, so many!) smudgy fingerprints have been scrubbed. Besides all of these mommy -based benefits to cooking with my kids, there are the developmental and educational benefits of cooking with children. The Occupational Therapist in me loves the sensory, fine motor, bilateral coordination, visual perceptual, and motor planning skill areas that are developed through cooking. There are SO many skills that can be worked on through cooking. Every Occupational Therapist recalls their time in OT school where they assessed each step of cooking a grilled cheese sandwich with their pretend client...all of the fine motor, strengthening, endurance, cognitive, and physical aspects of a simple occupation of making lunch. 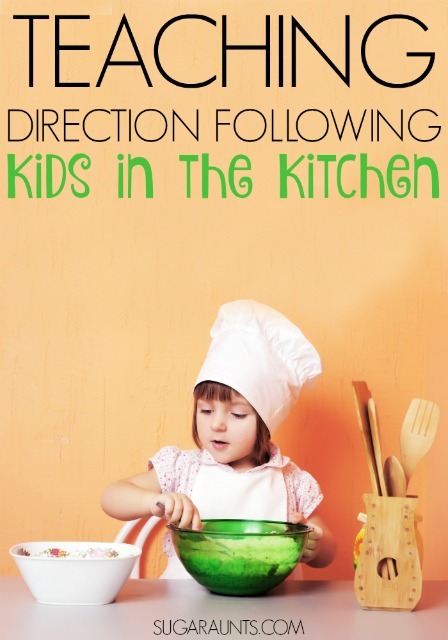 Today, I've got ways to work on direction following by cooking with your kiddos! Cooking With Kids in the kitchen provides unique opportunities. Kids can practice skills that are needed to imagine, prepare, create, and serve food. Each step of cooking requires attention to detail to prevent skipping steps or dangerous situations with sharp knives or hot stoves. Adults can help with direction following in recipes and food prep/cleaning up in many ways. Rehearse parts of the cooking process. This is especially ideal for safety concerns, like handling sharp tools or managing the stove. Verbal, visual, or physical prompts for appropriate behavior during cooking tasks. Practice turn-taking with tasks like stirring and mixing ingredients. Organize a child's participation with written directions. Some kids might need picture sequencing cards or social stories before beginning a cooking task. Break down tasks into smaller parts. Children can sequence parts of the task before starting. Use different techniques (written directions, picture cards, strips of paper with directions written out. The child must sequence the steps of a task before starting on the cooking process. Verbally tell your child one direction at a time to work on verbal direction following. Allow them to complete the tasks successfully, then add more complex or multi-step directions. Add more details slowly and don't add more until they are successfully following the next level of directions. Provide a written checklist for kids. They can mark off completed tasks. Together with your child, draw out the parts of a recipe. A visually organized list is better for some kids. Practice direction following with a simple task that the child knows how to do. If they can pour their own cereal and milk, instruct them to tell you or another child each step of the task. Act out or perform the activity as your child tells each step. They will be able to see any mistakes and self-correct, or correct their directions with a little prompting. Telling the step-by-step directions to another person is a great way to practice direction following. Discuss transitional words like first, second, third, last. Write out directions for a task like washing hands. Have your child sort the directions into order using the directional words. Problem solving in cooking can carry over to other areas like self-care and management of personal items. Communication and language development while talking about ingredients. Strengthened family support system through team working on a collaborative task. Personal and family well-being development. Sensory exploration of new or different tastes, scents, and textures. Proprioceptive input while cutting vegetables, kneading bread, stirring ingredients. Individualized modifications can be made to meet the child's needs and abilities. Meaningful tasks encourage carry-over of practiced skills. The kitchen is a natural environment and functional work here will lead to carryover of practiced skills. Cooking with various textures, colors and scents will encourage kids to try new foods. Now, Take the Direction Following out of the kitchen! Carryover the skills you've worked on with your kiddo in the kitchen into other areas. Use what's worked and use those same tips that I shared above in all areas. Sequencing cards, one step directions, activity breakdown...they can all be used in other jobs, too. Use the ones that work and modify the ones that don't. The best thing about cooking and working on direction following is the tasty reward to getting the job done, the together time, and the meaningful time. Use that to work on the tricky direction following skills and then try them in other areas. Cooking and food preparation is a task that is done daily in households. Cooking in the kitchen is an opportunity or learning and development that can be done every day. Practice some of these tips and hopefully, you will see some direction following development! This post is part of my 31 Days of Occupational Therapy series where I'm sharing 31 days of activities that use free or practically free treatment materials. While cooking and ingredients are certainly not free, food prep and meals are something that must be done every day. Use the opportunity to learn and explore with your child! The memories (and hopefully not flying flour!) will follow. Looking for a few recipes to make with your child? Check out our Cooking With Kids page for lots of recipes.